"Yes, it's all true. We are the greatest team of all time." The Carolina Devils are one of the league's best baseball teams, and their star player is first baseman Bret Packard (Mark Mench), an All-Star MVP who has become so bored with fame and success that he has begun a series of twisted Machiavellian games, pitting teammates against each other. Packard is the ultimate control freak, a pampered athlete who thinks nothing of sleeping with his son's babysitter, coercing pitchers to hit opposing players in the face with pitches in some bizarre competition or pulling the strings on a revenge murder plot when the Devils' right fielder has problems with management. 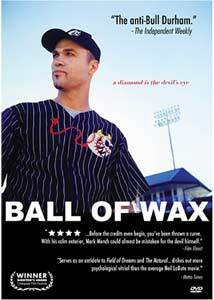 Ball of Wax was written and directed by Daniel Kraus, who did the eclectically odd Jefftowne, and once again working with a small budget has limited some of the intended impact. For starters, there is no sense that the team is any larger than nine or ten players, two of which are pitchers, and for a film about baseball that is an unfortunate shortcoming. Kraus manages to make the few stadium scenes work, but I was constantly distracted by how few players there were in the dugout at any given point. It took me out of the moment, and when that happens it is sometimes tough to get pulled back in. Small films like Ball of Wax often exist on the caliber of the acting, and Mench's portrayal of Packard is terrifically cunning, and he is immensely unlikable as the soft-spoken ball of coiled, evil energy that lives to manipulate and control others. Late in the film Mench delivers the film's most psychotically volatile block of dialogue (sadly rendered often unintelligible due to some sound issues) about the changes in baseball over the years, and it is a beautiful chunk that becomes one of the film's signature moments. Of equal note, though in a vastly underused supporting role, is Tracie Dinwiddie as Packard's exasperated wife Nat, who delivers another of the film's strongest performances, one laden with repressed anger and emotion that eventually spills over. Kraus admits in the commentary track that Ball of Wax got a little convoluted in the editing process, and the clarity of some of the backstories seems to get lost along the way. He has created a genuinely vile lead character in Bret Packard, something Mark Mench seems to do without much effort, but the budget constraints and whatever editing issues have softened the impact of what could have possibly been one of the better films to explore the dark side of professional sports. Image Transfer Review: Go Kart has issued Ball of Wax in a nonanamorphic 1.85:1 widescreen transfer, and the coloring is rather soft throughout. The print is clean of any debris, with no major grain problems, and for a low-budget film the transfer is fair. Audio Transfer Review: Audio is provided in a 3.0 Dolby stereo, and the mix is distractingly flat, something that is unfortunate considering it doesn't do justice to the outstanding score by Eric Bachman (Archers of Loaf, Crooked Fingers). This flatness is further accented by Mark Mench's occasional mumbling of key lines of dialogue, which when combined with no subtitles makes understanding some scenes a challenge. Extras Review: Writer/director Daniel Kraus and lead actor Mark Mench provide a commentary track, fueled by some vodka drinks, and one of the first things I appreciated was Kraus' admission that the finished film is somewhat confusing. He blames it on a combo of editing and budget, and he tries to fill in some of the cracks that would have been best answered onscreen. Kraus leads the track, with Mench chiming in periodically as they discuss the original titles, money issues and that the original story was set on a college tennis team. There are three Deleted Scenes, running just over ten minutes, the best of which is the shortest, featuring an extended cut of the team having their baseball card photos taken. Clips from the Auditions (07m:20s) in the spring 2000 show the film in its early incarnations, and the Film Festival Q & A (09m:46s) follows Kraus and crew on the festival circuit. The NPR All Songs Considered radio/web broadcast segment (03m:23s) features music from Eric Bachman, who composed the original score for Ball of Wax. The disc is cut into 28 chapters, with no subtitle options. Ball of Wax never rose to the level I had hoped it would, and I imagine budget issues handcuffed director Daniel Kraus from ultimately making the film he really wanted. Mark Mench is a genuine piece of movie villain excess, a dark and disillusioned ball player with evil, downright deadly schemes and very little in the way of morals.